I have a rich dream life…sadly, most of the time I don’t remember them. But while I was sleeping one night, not so long ago, I dreamt that my father in law was with me. 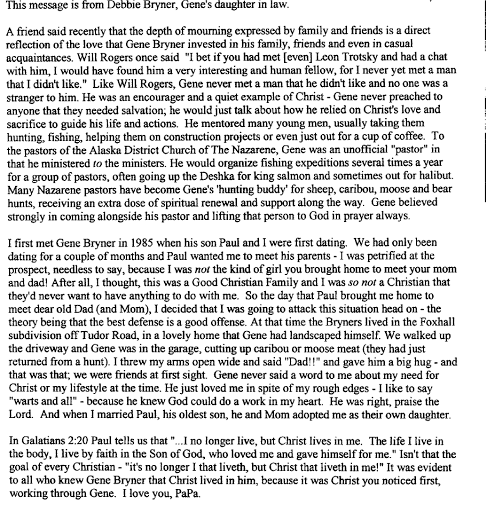 PaPa Gene-O, as my son Rhys always used to call him, died on July 10, 2006 while climbing Flattop. He was training for his annual fall sheep hunt and, at the young age of 75 could hike the mountain in under an hour. The last photo we have of him is one that a fellow hiker took. The fellow – Rick McGahee – and his wife were in Anchorage, celebrating their anniversary that day and had decided to take a hike up Flattop. They were the last people to see my father in law alive. This has been a Finish the Sentence Friday prompt – “While I was sleeping, I dreamt…” hosted by the always amazing Kristi Rieger Campbell of http://www.findingninee.com, and Sentence-Thinker-Upper Deirdre Conran of Deirdre’s Daily Dose at https://myblogforlife.wordpress.com/. Beautiful post! I am sure that somewhere up in the heaven, your father in law is smiling and listening to all the kind things that you think about him. Thank you, Ankita…they're all true. He was like Atticus Finch in a way…one of the best people I have ever known. Oh that photo of him hiking. Wow. It looks like the most unforgiving spot and you can tell he's determined to conquer it. You were indeed blessed. I'd wager that not many women can say their father-in-law was truly the father of their heart and their dear friend. And I agree with Ankita's comment that he's up there in heaven smiling and listening to your kind words. 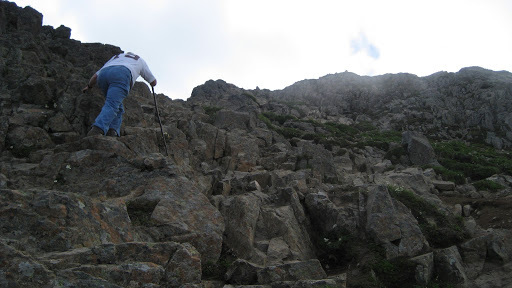 As it turned out, shortly after McGahee took the photo of PaPa, he rounded the corner, about 50 feet to the summit…and died. He fell down the mountain and they told us that we REALLY didn't want to see his body…because there are boulders all down the side of Flattop and, well…fortunately, he was dead before he actually fell, for which I am thankful. He was such a good man…and his sons are just like him. The one flaw, if it can be called that, was that my father in law could not admit to himself that my daughter was autistic…when I told him that I was taking her for testing, he was very upset with me about that. He never said anything…but I knew. That's the only regret I have when I think of him…that he would absolutely NOT accept that Kate is autistic. He loved her so…when I was pregnant, he knew – really, seriously – he KNEW that she was going to be a girl…and it was the same with my son. PaPa said he would be a boy, and that was that. I'm blessed, really…God, I miss him so much! what a gorgeous post and an amazing tribute to your father in law. That hike looks harrowing for anybody… I agree with Kelly too – not all can say how close they are to their father in laws and I love love love that you had this type of a relationship with him and that you dreamed of him. I know he's smiling and saw this writing in your heart before it was on the page. Thank you.